Did March feel slow or bogged down for you? If so, chalk it up to Mercury retrograde, which brought many challenges for us all. Now Mercury is moving forward once again, and the Sun is in “ready, set, go!” Aries at the start of April. You may feel the fiery passion of Aries and want to get going after the March doldrums. But you’ll be better off if you wait just a bit longer. From April 1 through 5, the Moon will be at the close of her monthly cycle as she moves through the balsamic Moon phase. That’s the quietest, most dreamy and mysterious of all the Moon’s many phases – and the best for meditation and introspection. There’s a new Moon on April 5, which will put the wind in your sails to venture forth into new and exciting waters. With the Sun moving through Aries, this is your best time all year to focus on anything that expands you, your life, and your consciousness. Anything international will find favor, from travel (for vacation or business) to working with overseas colleagues to trying new cuisines at interesting restaurants or in your own kitchen. If you need to handle anything related to visas, passports, or immigration, now is the time to work on it. Target April 5 to start any of these projects. This part of your chart also governs expansion through publicity, publishing, broadcasting, or big media. If you work in any of these fields (or wish to), take action in the two weeks starting April 5 to move closer to your goal. Expansion also can come through higher education. If you want to pursue a degree or need to start an important paper or academic project, this period will help you. On April 20, the Sun leaves Aries for money and value minded Taurus in your tenth house of career. You’ll need to shift gears then, applying all your international and educational gains (and any other expertise) toward upgrading your professional life. With the Sun moving through this very top point of your astrological chart, you may find yourself in the spotlight, so put your best self forward at all times. Also, if you want to improve your work life, take steps toward winning a promotion or new job or to securing recognition through an award, raise, or leadership opportunity. If you have your own business, you can gain more notice for your work or earn greater visibility in your industry. If you’re more senior in your profession, considering mentoring others. The full Moon on April 19 will be the second in a row in harmonizing Libra. Use clues from that period to guide you this time. You may learn important news related to your brothers or sisters (or to close cousins or friends who feel like siblings). You also could have a breakthrough related to a communication or social media project, a presentation, or your personal communication style (including body language). Travel also may come into the picture, perhaps with a change in plans or a new opportunity. Pay attention to any information revealed during this time. 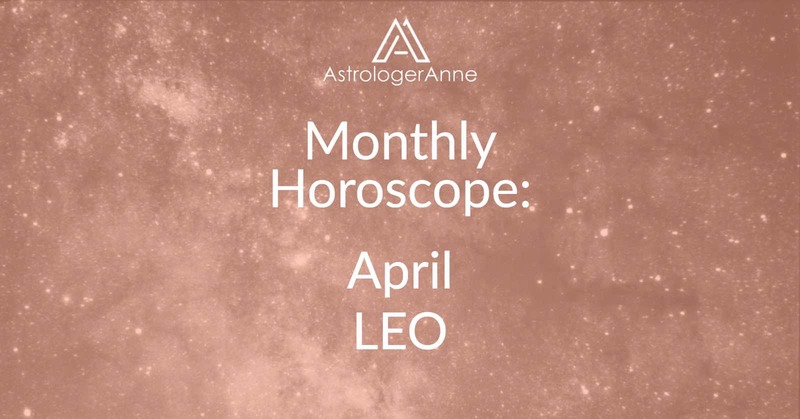 Have a happy April, Leo! I wish you a wonderful month!